The history of the Lowcountry comes alive at this large Southern cottage. 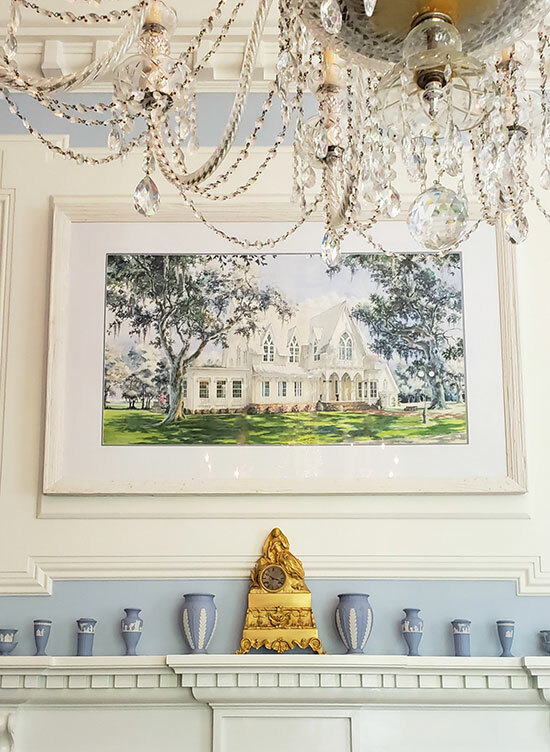 You’ll want to be sipping on some sweet tea for this tour as you’re transported through the splendor of the Rose Hill Mansion. Often called the South’s most beautiful plantation house, historic Rose Hill in Bluffton, South Carolina, is now open to visitors. The Rose Hill Mansion, as it’s now called, started out life in 1858 as a beautiful plantation home. Originally built for John Kirk and his wife Caroline, the house was then labeled a “cottage” to sit among 1,000 acres of valuable land growing sea-island cotton, indigo and mustard. When finished, this cozy cottage turned out to be a 10,000 square foot Gothic Revival Mansion, built of bright white board-and-batten cypress siding with a steeply pitched roof and brick foundation. The lovely white façade of the Rose Hill Mansion seen through the grove of oak trees. Rose Hill is named after John Rose, the original owner of this land who purchased the property in the 1770’s. After his death, he gifted the land to one of his stepsons in the Kirk family. Now the property is surrounded by hundreds of real-life roses, in honor of its namesake, founder of Rose Hill. 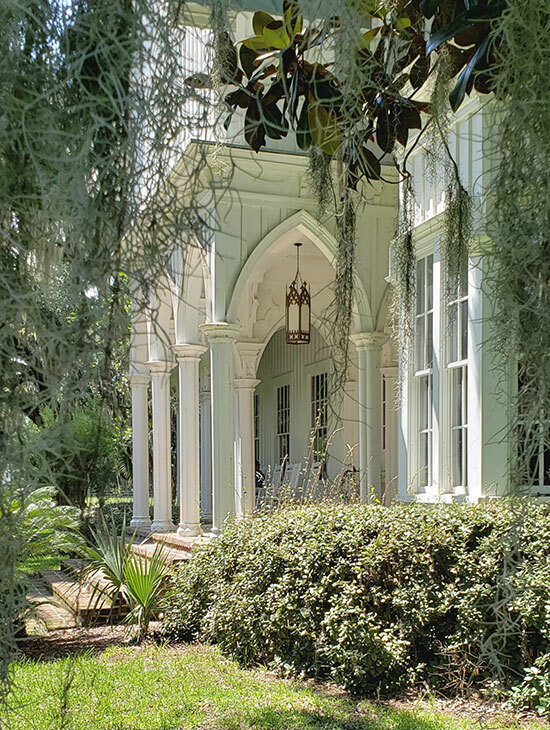 Swags of Spanish moss surround Rose Hill and frames it’s beautiful Gothic arches adding a sense of mystery to the intriguing history of this home. 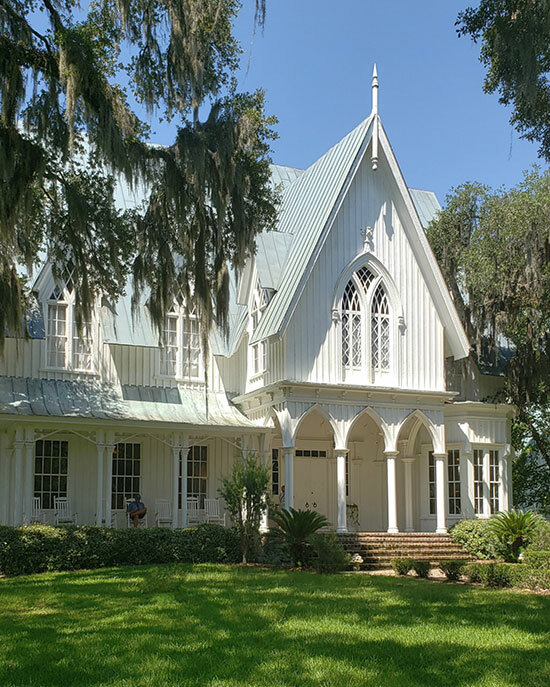 Legend has it that when Yankee troops invaded Bluffton during the Civil War, they chose not to burn this mansion because of its resemblance to a church, and felt it was too beautiful to destroy. It survived until, as luck would have it, a fire destroyed most of this home in 1987. Beautiful family artifacts and a collection of antique paintings are displayed in the dining room. Current owners Robert and Robin White purchased the charred structure in 1995 with the dream of restoring it back to its original splendor, and they’ve succeeded in bringing back this amazing architectural dream and saving it from total destruction. 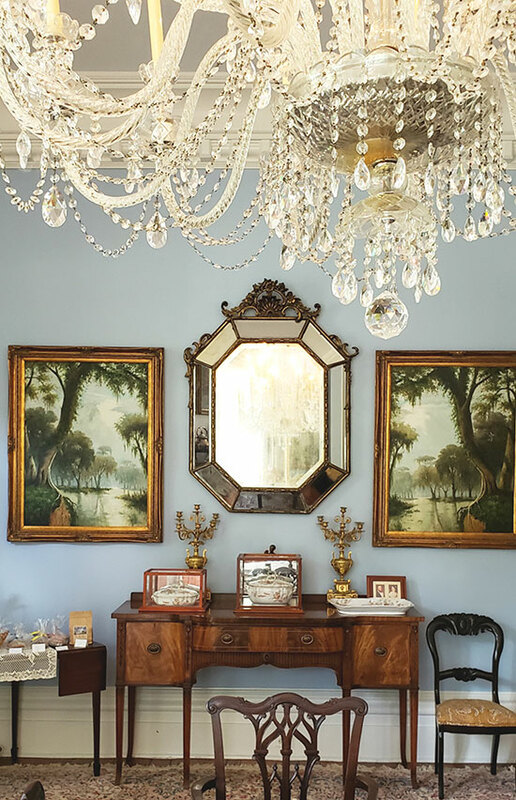 Although the Whites are full-time residents of the Rose Hill Mansion, they generously open their home to guests who can reserve a guided tour. Rose Hill is also a beautiful location for weddings and other festive occasions. 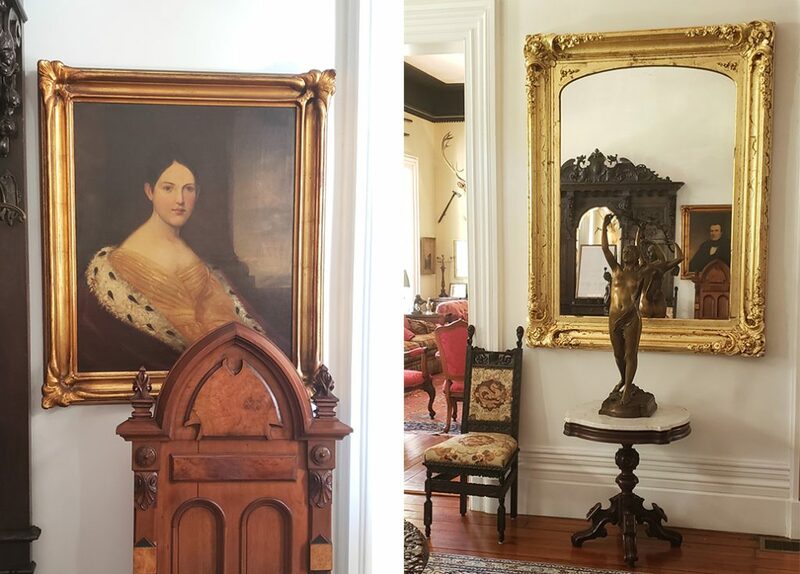 On the left, a portrait of Sarah Elizabeth Connor, a Kirk family member, greets guest in the entrance hall of Rose Hill. On the right, a view of the large entrance hall looking into one of the front parlors. Driving into the private community surround Rose Hill, we were really wowed by the sheer beauty of the surroundings. 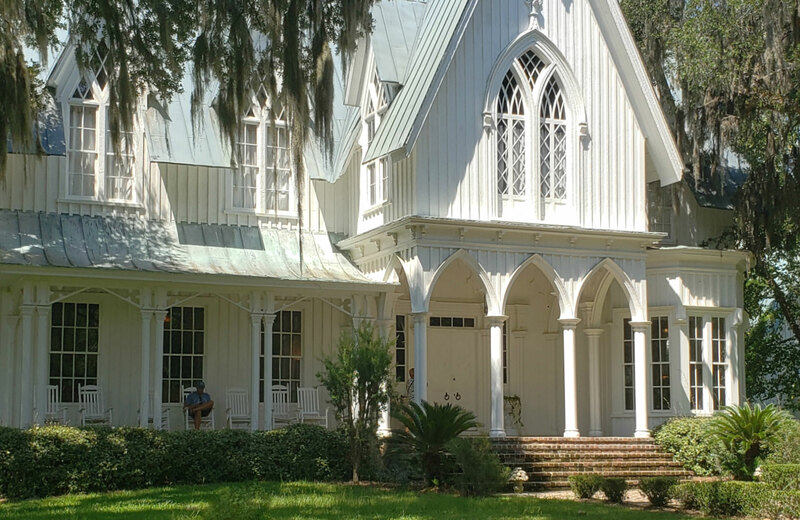 As we approached this home along the winding road, we suddenly saw the magnificent white peaks of the roof appearing behind centuries-old oak trees that were just dripping with Spanish moss. Up close the home is equally as stunning as it is viewed from afar. Above the mantel in the dining rooms sits an exquisite portrait of Rose Hill painted by artist Nancy Rhett. A short drive from Savannah or Hilton Head, the Rose Hill Mansion is open during the week at 2pm for guided tours. On the tour, you’ll visit each room on the first floor while hearing the fascinating history behind this pretty home. The tour concludes in the dining room with a delightful variety of regional appetizers and desserts to sample. Thinking about seeing Rose Hill yourself? The property is a private residence so no unannounced visits but you can book a reservation for a guided tour here. Creating beautiful tablescapes is one of Fabiana’s many talents and passions. She regularly shares her delicious recipes on her blog, Ciao! Newport Beach and on Instagram. Looking for more travel ideas check out this post on charming English cottages that you can rent.